Your Wedding - Kids or no kids? Weddings are a time for celebration and sharing good times. Some couples want to share their love and excitement with as many people as they can fit under one roof, while others may prefer a more intimate affair to enjoy with a select few. One difficult decision couples must face when planning a wedding is whether or not to invite children to join in the festivities. Young guests can bring an energetic spark to the celebration, but kids unaccustomed to dressing up and enjoying a fancy night out may get swept away by the majesty of the night. Adult guests looking to have a good time may find it difficult to relax and let loose if they have to keep a constant eye on their children. The topic of children at weddings is a tricky subject. Family and friends may have strong opinions on either side of the debate. Ultimately, the couple needs to come to an agreement regarding children at their wedding. Once a decision has been made, couples can employ some strategies to make the wedding as enjoyable as possible for every age group. Couples who decide to exclude kids from their guest lists should alert guests well in advance of the "no kids" edict. Be tactful when alerting guests. If you will be sending out save-the-date cards, include the phrase "Adults only, please" on the card. You also may want to include the information on a wedding website if you have one. A website affords you more space to explain your stance on young guests. When it comes to the wedding invitation, your indications should already be clear. However, you can reinforce that kids are not invited by addressing the invitations accordingly. Do not include the children's names or "and family" on the envelope. Invitations should only feature the names of the people being invited. Be consistent if you do not want children at the reception. It is not okay to allow one guest's kids while excluding another's. The only exception is children who are members of the wedding party. However, if you prefer a kid-free wedding, you may want to avoid a ring bearer and flower girl during the ceremony. Chances are word will spread that the wedding is not for child guests. If you do not want to handle inquiries, ask a member of the bridal party to answer any kid-related questions. 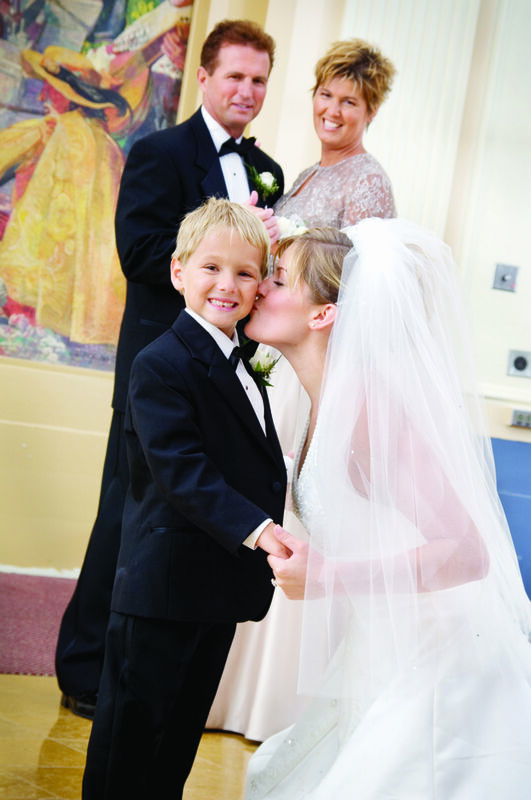 Contrary to popular belief, children can be well-behaved at a wedding and add a youthful component to the celebration. Watching a child twirling on the dance floor or devouring a large piece of wedding cake can make a wedding day more memorable and special. Couples who invite kids to the wedding should expect the unexpected from their youngest guests. Let the small things slide and speak with youngsters' parents if any issues arise. Arrange for some activities to keep children entertained and out of trouble. Have the band or deejay incorporate some child-friendly dances or activities. Designate the kids' table and arrange some small toys or activity books. Be sure to choose some child-friendly foods during the cocktail hour. Hungry children can be that much more fussy. Arrange a special menu with the catering manager and be clear about how many kids are invited. Usually kids' dinners cost substantially less than adults'. Some reception sites may provide a separate room where children can gather. A television with a favorite movie or a few video games may be all that's necessary to pass the time. Hire a babysitter to stay with the children and give adults in the other room peace of mind. You may want to include older children at the wedding but have younger ones stay home. As you would for a wedding without kids, spread the word that there is an age limit. On save-the-date announcements, request that "No children under age 12" attend the wedding. Be prepared for some opposition from guests whose kids fall under the age limit. Just be firm with your plans.